John and I met a few months ago while working for a mutual client. Over lunch one day, I learned about his business ventures including the bed and breakfast he launched and ran from 2001 to 2006. I was immediately struck by his out-of-the-box approaches to developing a successful business—starting with a mindset of collaboration not competition. “There were five B&Bs in the town we were serving, including mine. I suppose I could have looked at the other four as competition, but I believed there were an abundant number of customers and no way to accommodate all of them 365 days a year without leaving business on the table. I knew that the only thing preventing us from tapping into the full potential of the market was letting the public know about all of us. And I knew the best thing to do would be to have all five inns working together, viewing ourselves as a unit and viewing the hotels in town as our collective competition. “My life philosophy is there’s plenty of everything—customers, money, everything. You just have to direct it to you. John took a systematic approach to convincing each B&B to adopt his mindset and approach—first, he built trust individually, then he approached the group as a collective. John says another key was in thinking of all the B&Bs as a whole. “I’m a big believer in win/win. Sure, I would’ve loved it if my B&B filled first. But my over-riding belief was if we had 35 rooms and 50 people looking for rooms, even if mine were the last ones filled they’d still be filled. John and the other B&B owners consistently put customer needs ahead of any one B&Bs’ needs. John’s mindset of “customer” extended to the community as well. The results John got speak for themselves: a 25% increase in occupancy rate over a year (which is a big number in the hotel business) and double the number of advertising impressions without any additional investment. John emphasizes that the strategy isn’t viable without the mindset that goes along with it. Here’s to big dreams with big results. Connect with John on LinkedIn . 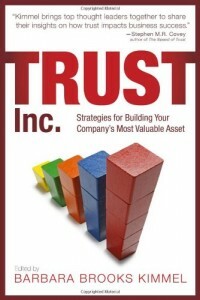 and Janet Andrews: What Trust-based Strategy Consulting Looks, Feels, and Sounds Like.